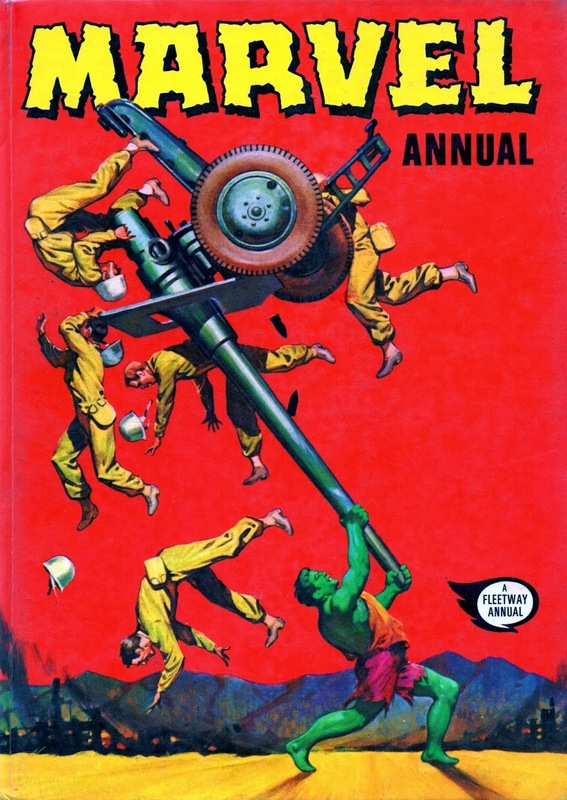 One of my favourite Annuals was the MARVEL Annual for 1973, which went on sale late, in November of '72, as opposed to August or September. 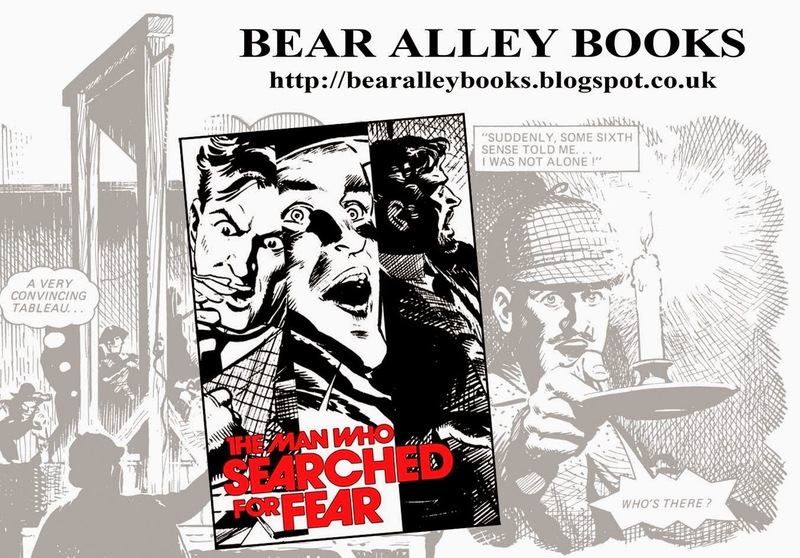 I first saw it in the window of a great shop that used to be in my town - W. & R. HOLMES - and I bought it at the earliest opportunity. 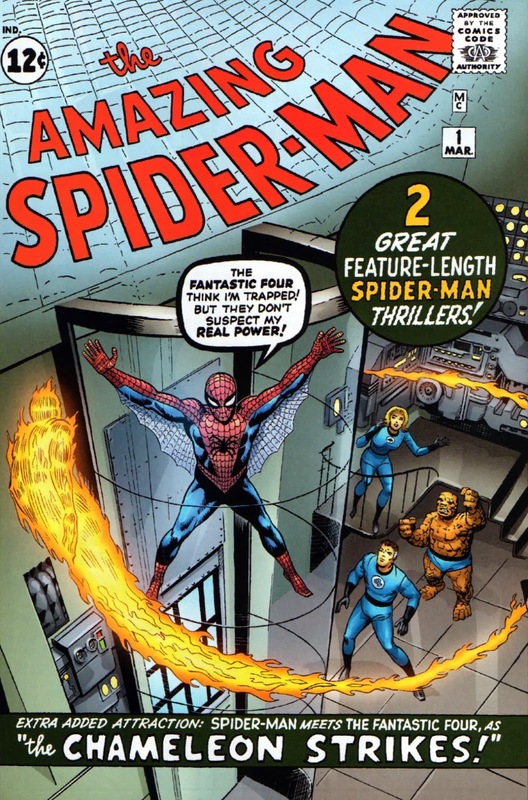 It's odd that it was released later, so could it, perhaps, have been an afterthought in the minds of Marvel? 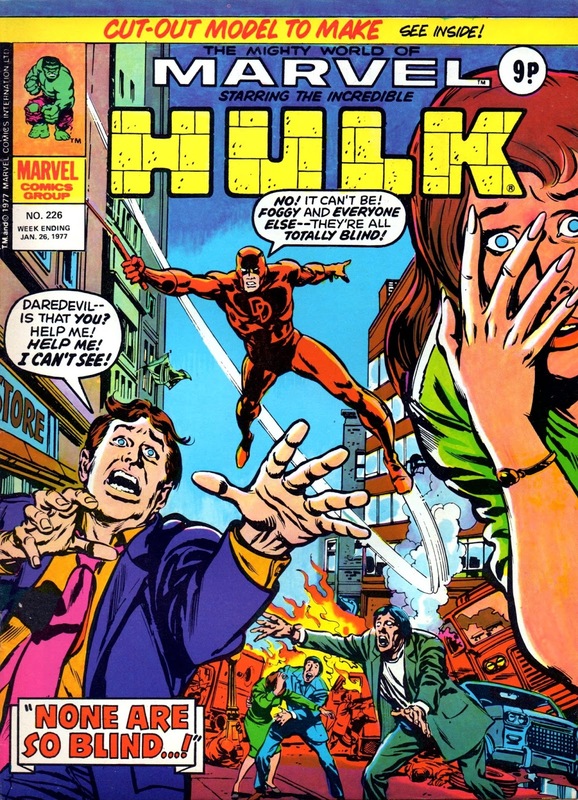 Though it's always possible that it was published at the same time as the other Annuals and held back a bit, on account of some of the stories also appearing in the early issues of its weekly counterpart - The MIGHTY WORLD Of MARVEL. 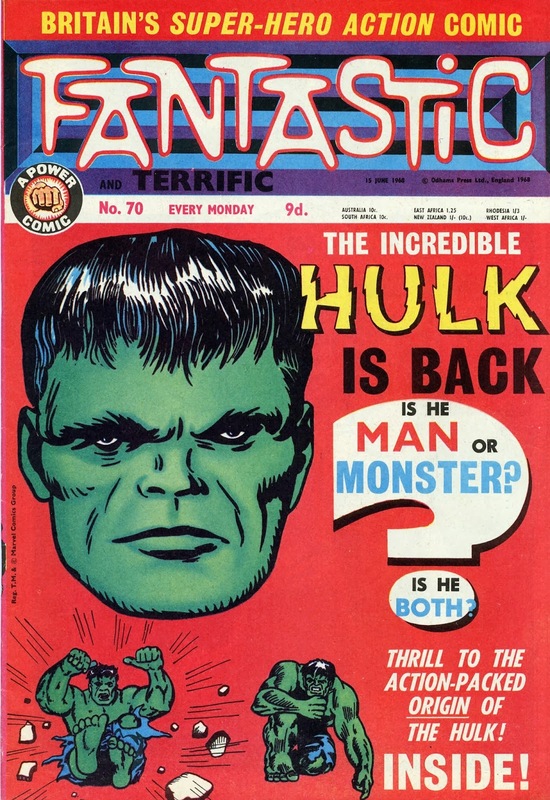 On reflection though, it seems likely it was prepared prior to the release of the weekly as, inside, it refers to (according to DEZ SKINN in a 1979 magazine article) the comic's proposed title, The WONDERFUL World Of Marvel, which was probably changed for any one of three possible reasons. 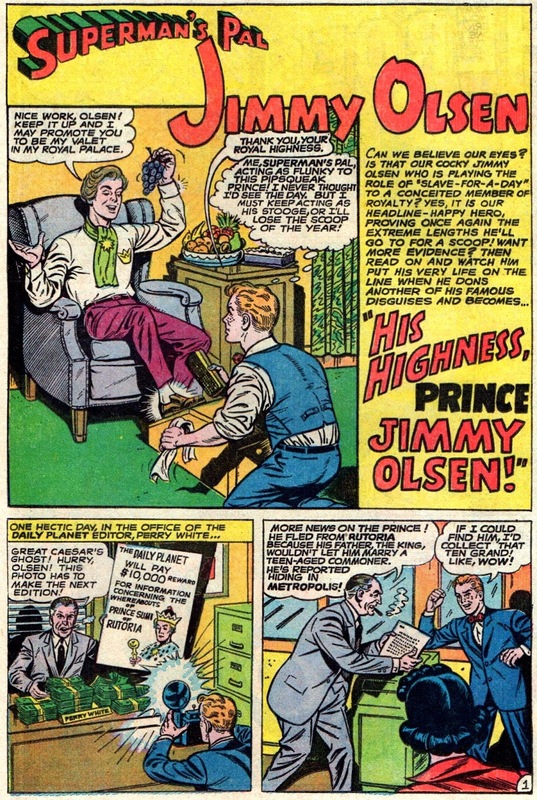 Firstly, that it was too long; secondly, to avoid any problems with DISNEY who had a television programme of a similar name (ironic in that Disney now owns Marvel); and thirdly, that 'Mighty' just sounds better! 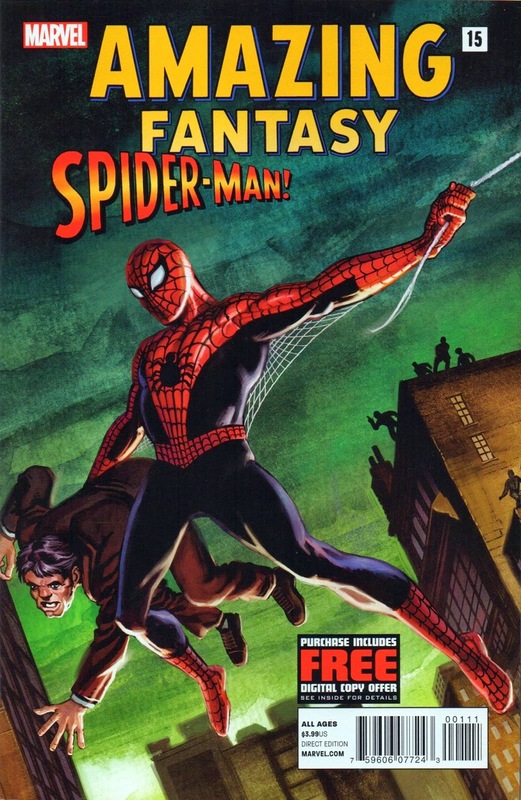 (It seems that there was still some indecision over the name when the cover was prepared, as the book was simply called Marvel Annual.) Although ads in the comic showed a picture of the cover with a 1973 date on it, the actual published cover was undated. 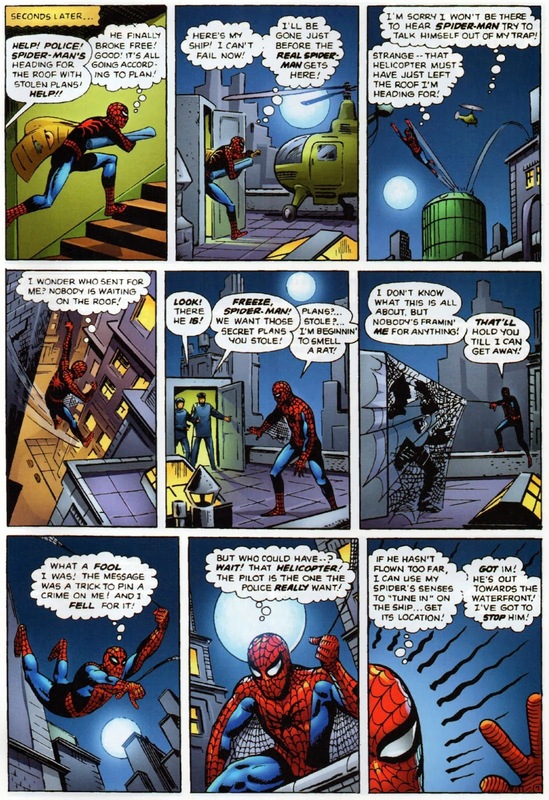 It's interesting that both the Marvel and Wham! & Pow! 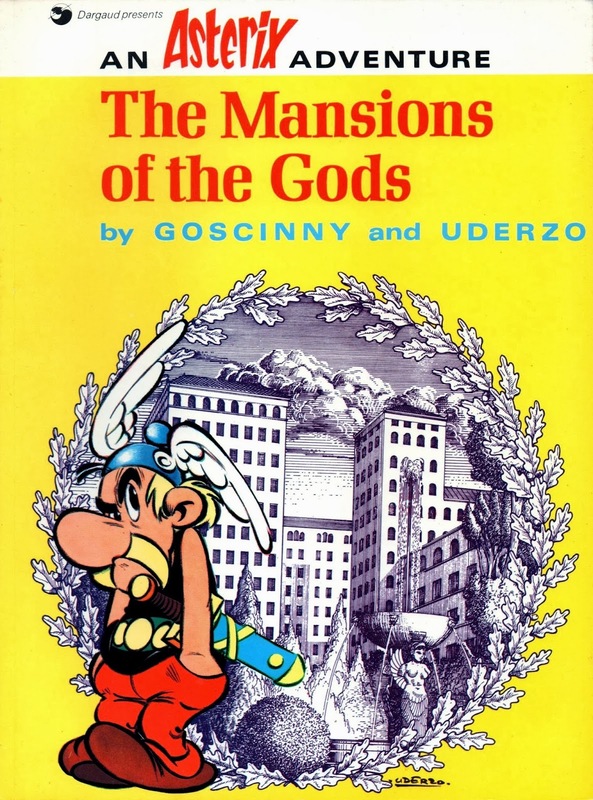 books had 128 pages (including covers), but that Wham! & Pow! 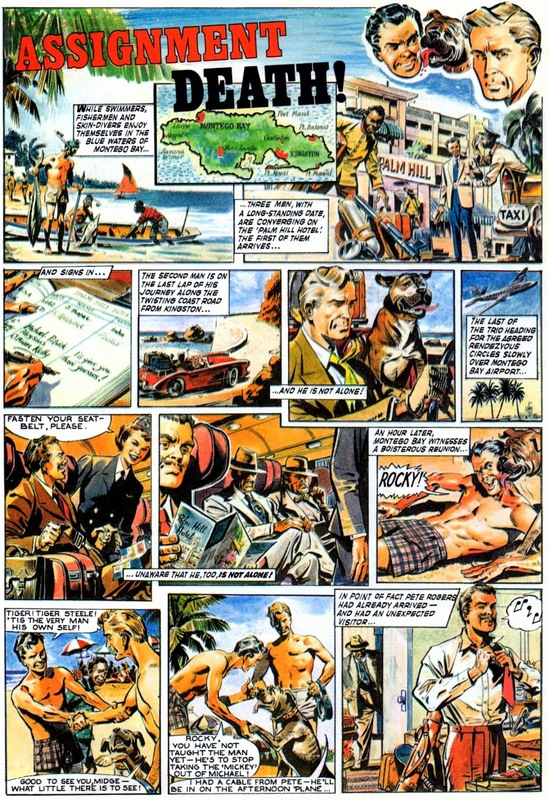 had 30 in full-colour whereas Marvel was mostly black and white with 16 pages of spot-colour. 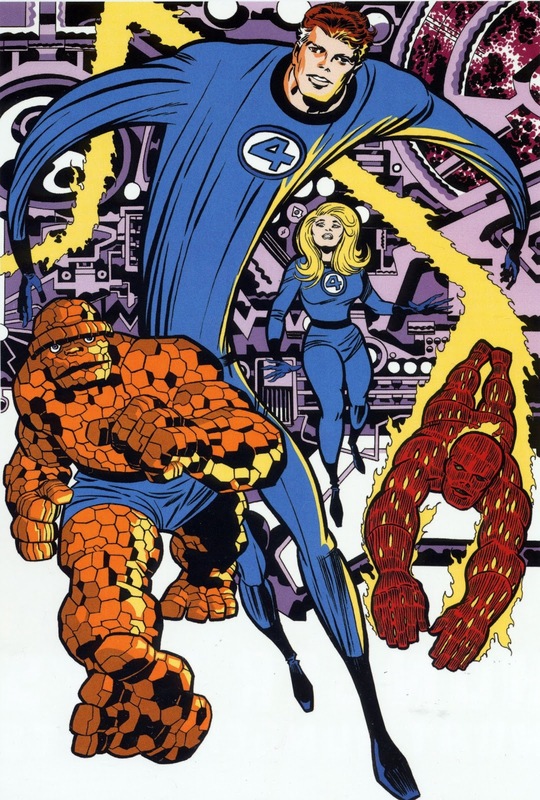 As both Annuals were priced at 65 pence, I can't help but feel that readers were being a little short-changed in regards to the Marvel book, which would certainly have benefitted from the inclusion of full-colour. 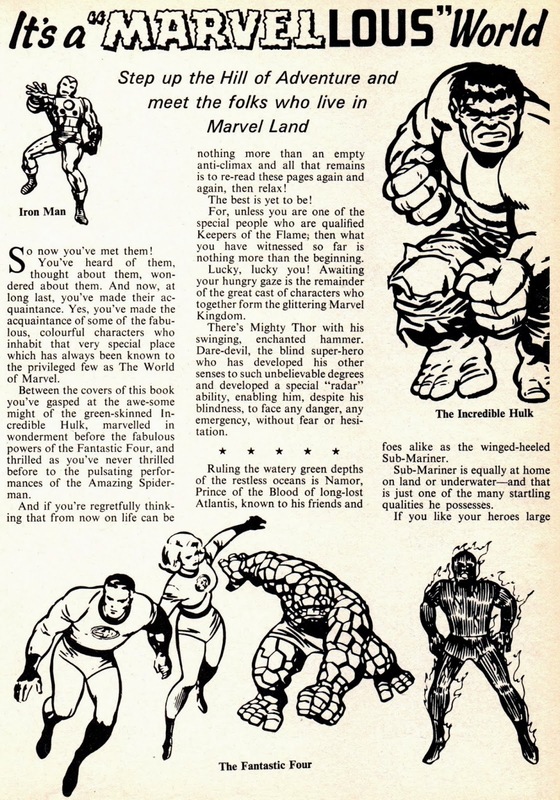 Marvel must have supplied brand-new proofs to IPC for the book, because I once saw some of the original ODHAMS proofs from the '60s in the IPC art vaults and they were all resized two pages-to-one, unlike the '73 Annual. 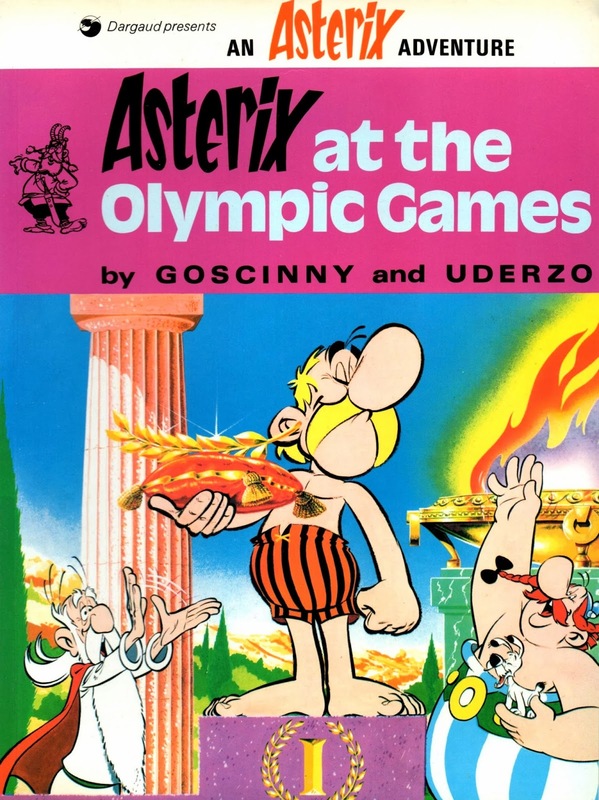 Perhaps keeping Annuals in print in perpetuity is nothing but a pipe-dream, but, with the advent of the Internet, while actual print editions might never be republished (though it's been done with the RUPERT Annuals), there's no reason at all why online versions of them couldn't be made available (at a modest price), allowing readers to print their own copies. What do the rest of you think? Don't be shy about having your say in the Criv-ites' comments section. I'm feeling fair chuffed with myself. Here's why. About 33 years ago, I bought a pack of 'Heritage Library' book covers, the purpose of which was to transform paperbacks into hardbacks to make them look more impressive on one's. 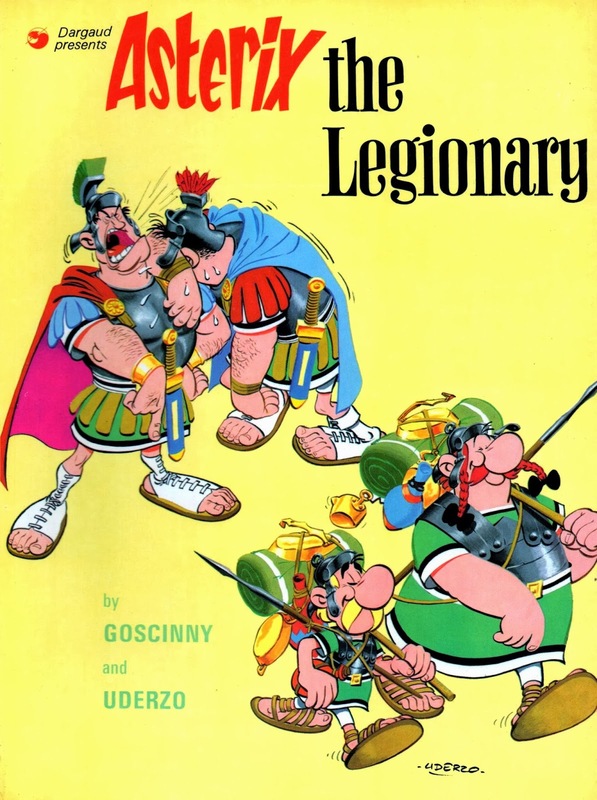 I duly performed the operation - which involved removing the backing from the adhesive interiors of the covers and inserting the books - on three or four paperbacks I had. The results were not quite so impressive as I had imagined and I immediately regretted my rash action. Too late. alas - the new covers could not be removed from the books without inflicting major damage, so I just had to live with them. One of the volumes was a paperback of The Wind In The Willows, which I vaguely noticed was now the precise dimensions of an actual hardback edition of the book I also possessed, but it was to be quite some time before my mighty brain 'joined the dots' and came up with a rescue plan. Anyway, to cut a long story to a slightly shorter (but still too long) one, the other day I rediscovered said transformed book and decided to restore it to some semblance of normality. I dug out my copy of the 'genuine' hardback and scanned the dustjacket, and then printed off a replica of it, resulting in a perfect fit for the compromised edition. 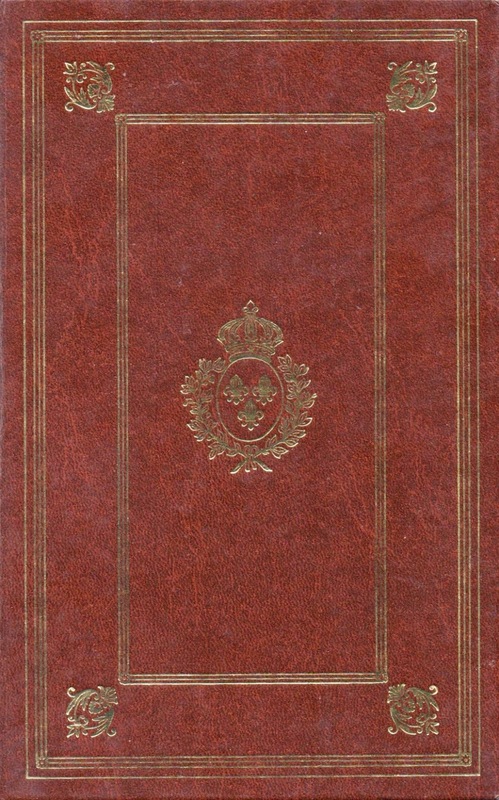 All I need do now is obtain a clear protective sleeve for the dustjacket, and the book's integrity will be fully restored. Don't believe me? See for yourself in the accompanying photos. Not a bad job at all, if I say so myself. 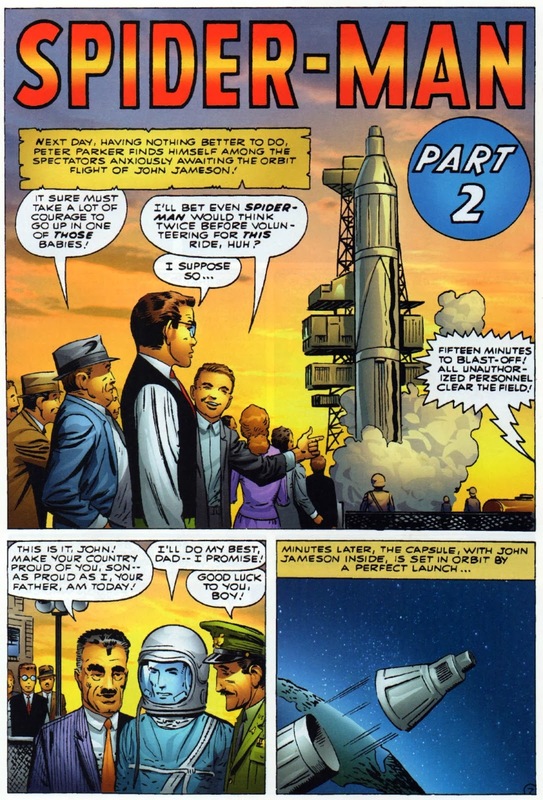 the tale, having begun with issue #2 when the strip debuted in SMASH! of the story, regarding it as redundant for their purposes. IRON MAN, X-MEN and DOCTOR STRANGE. the 'luxury' of an outside toilet in the back courtyard. that failed to attract any more attention than before. brother perpetrated our doggie-poo trick. Ah, memories! 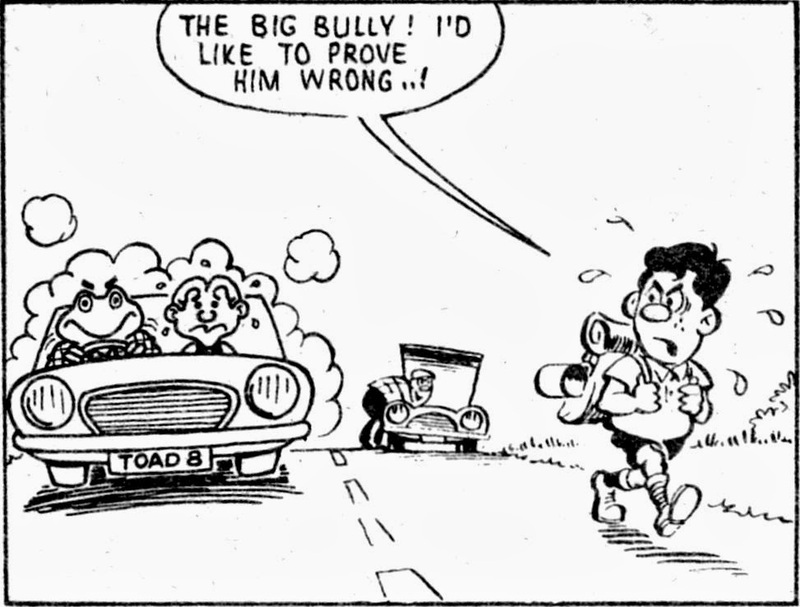 My first-ever strip appeared in my local newspaper around 1975 or '76, I think. 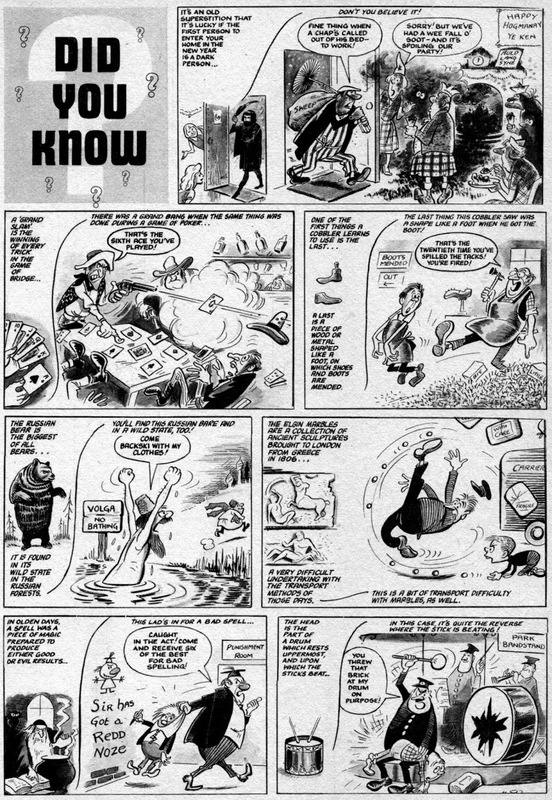 (I'm sure it pre-dated my GORDIE GOOSE full-page strip in the BOOTS NEWS.) It was called E.K. 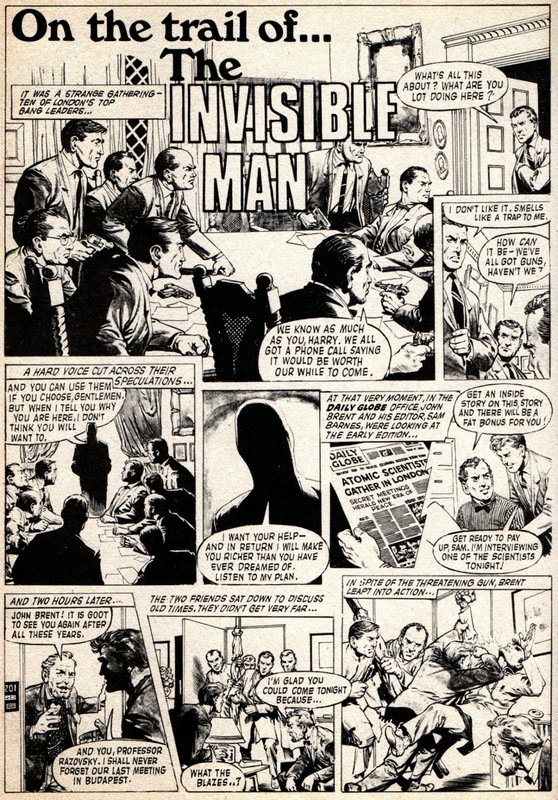 KID, consisting of a single tier of three panels, and earned me a whopping £5. 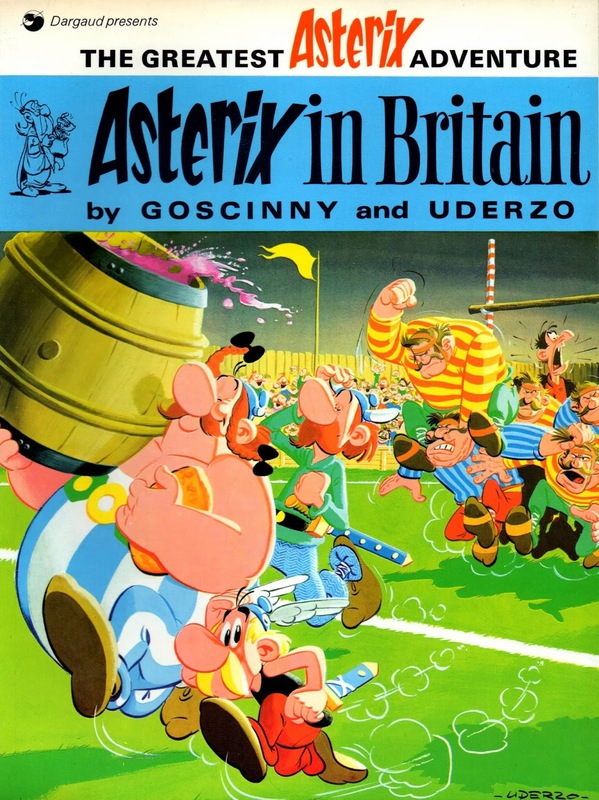 To be honest, it wasn't very good, but hey, a fiver back then wasn't to be sniffed at. Mr. ERIC BARR (now sadly deceased) was the discerning editor who tried to encourage a relatively recent school-leaver in developing his talents. 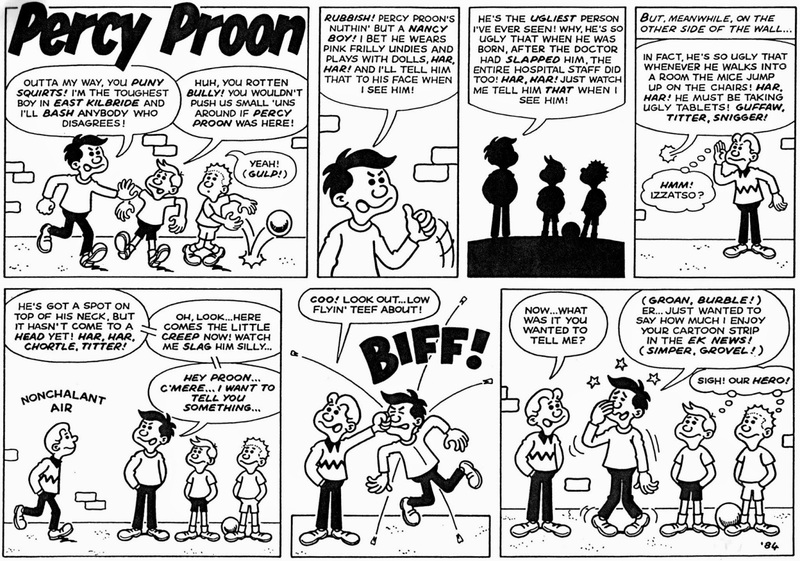 By 1984, my latest creation - PERCY PROON - E.K. 's No. 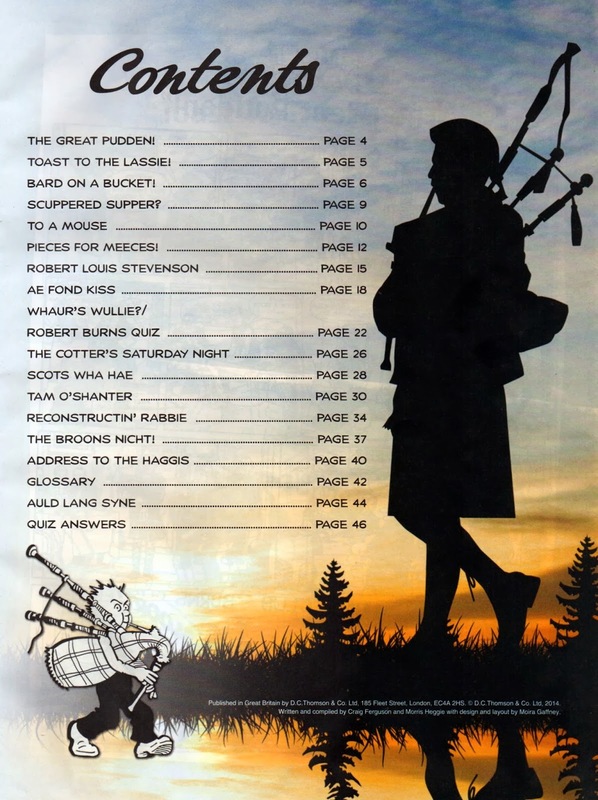 1 LOON - had already made a couple of appearances in the local rag, so I produced a third helping for possible publication. 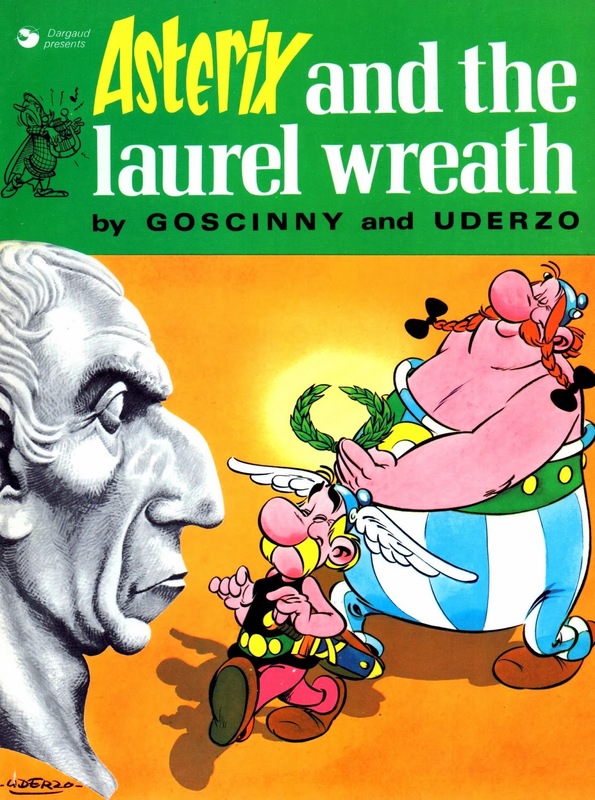 It was rejected for being "Too verbose and too violent", though this could simply have been Mr. Barr's coded way of telling me it just wasn't very funny. 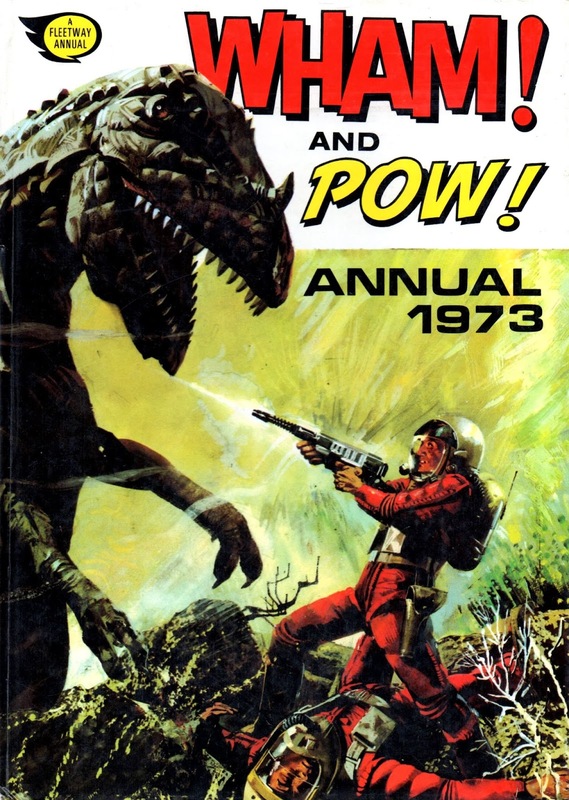 I never got a chance to do any more, for later that same year I met IPC's STEVE MacMANUS at a Glasgow comic mart, who promised me some lettering work on 2000 A.D. A couple of months or so later, at the beginning of '85, my full- time career working for the 'big guns' had begun. However, that wasn't the last to be seen of Percy. 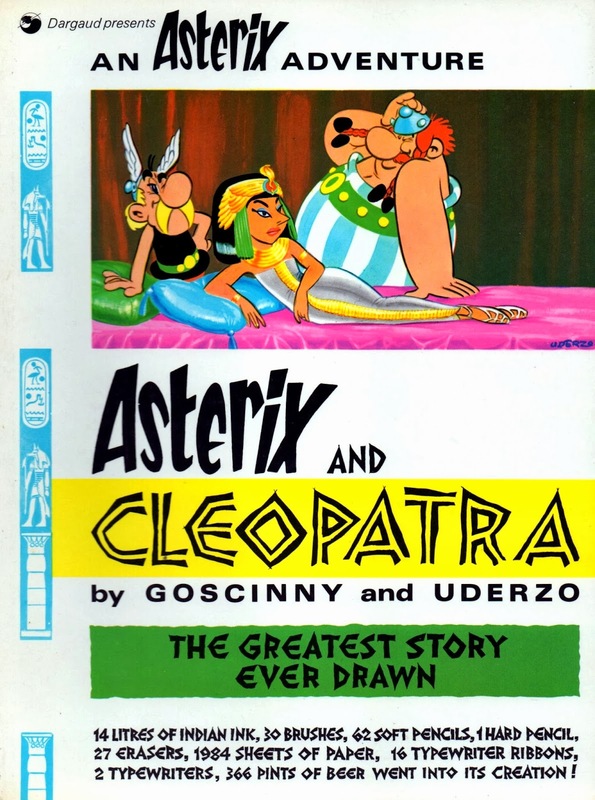 When I was re-sizing strips for the WHIZZER & CHIPS and BUSTER comic libraries, I would often draw in 'E.K. 's No. 1 Loon' to fill up space. 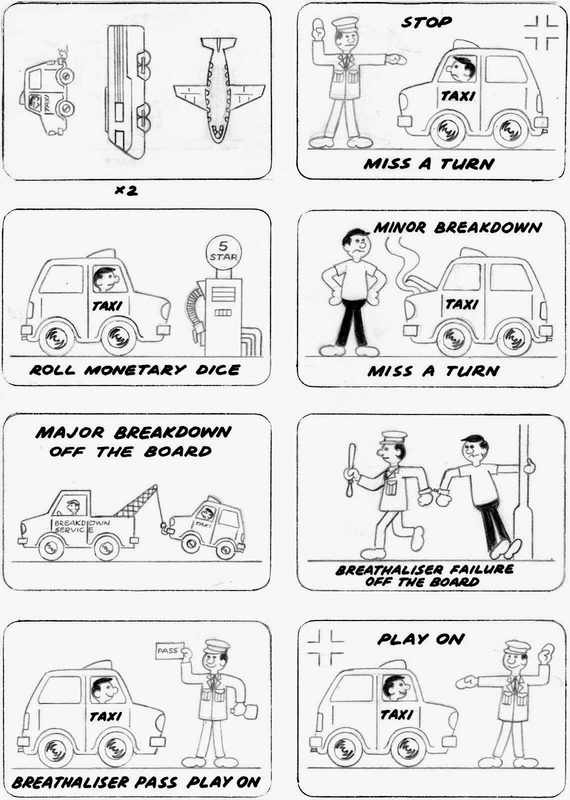 (There are a few examples below). 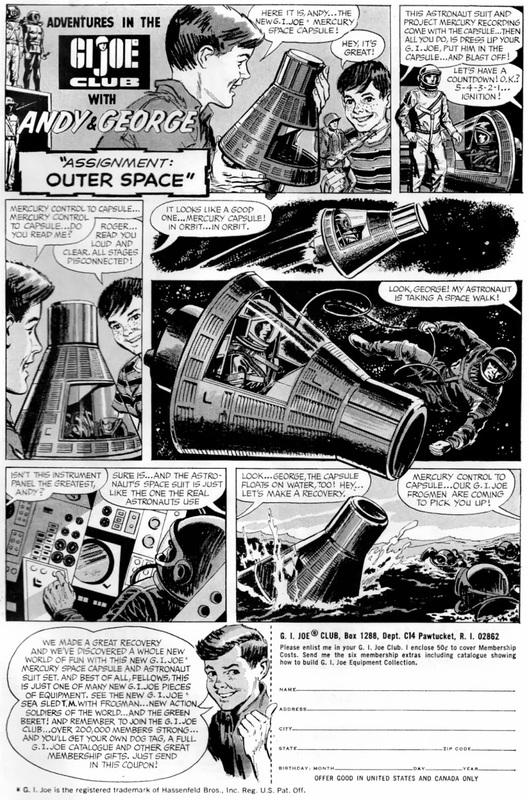 Regarding the above strip, it was drawn with a felt-tip marker and lettered with a fountain pen, and is a nice, clean, nothing brilliant drawing. If I were doing it today, I'd vary the thickness of the outlines and give the characters circles around their eyes, because 'dots' alone restrict facial expression to some degree. this, the world's greatest blogazine - DIAL 'B' For BULLSH*T! the history of the world, am going to prove it to you right now. on the pertinent points which prompt my cataclysmic claim. 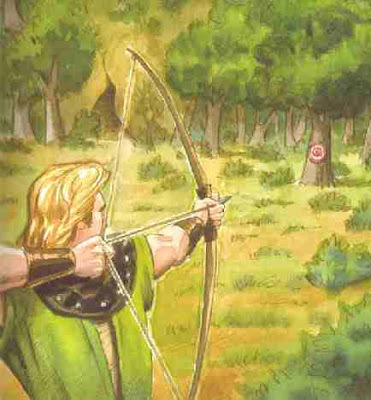 justice, enabling him to smite his enemies from a distance. hued epidermis is reminiscent of Tuck's ruddy complexion. of his fiery alterego being the living embodiment of Will's surname. 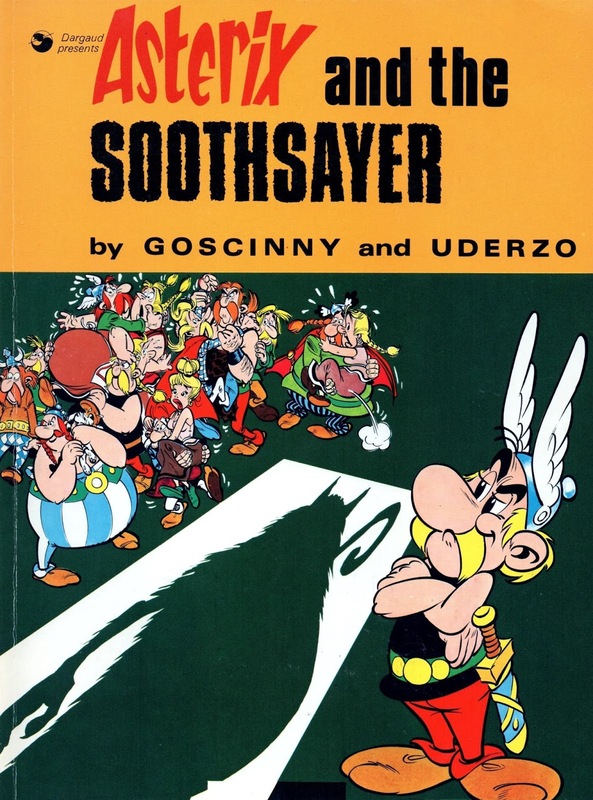 as Johnny has done when tossing fireballs at the bad guys. 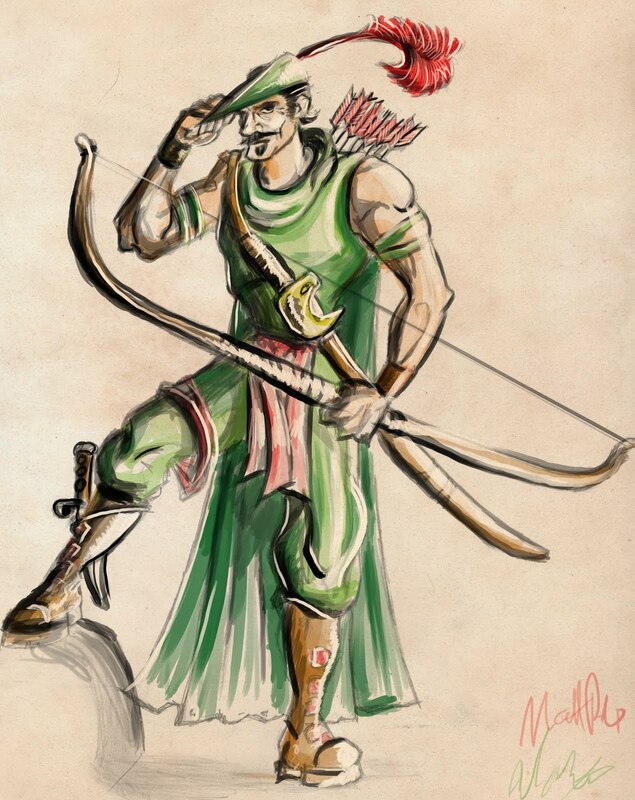 inspired by and based upon Robin and his outlaw band. 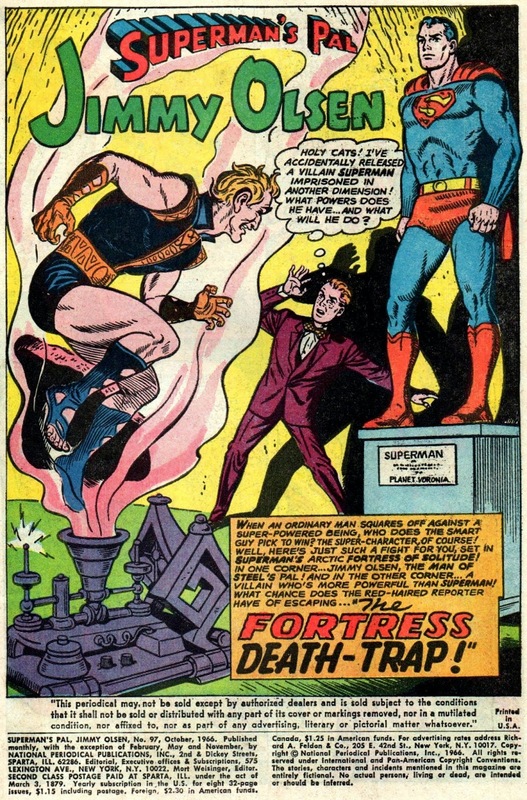 archetype on whom the FF's arch-foe, DOCTOR DOOM, is based. is to wipe Reed and his team from the face of the Earth. save you from the tedium of your vapid, pointless existence. It's amazing what one can find whilst digging through cupboards. 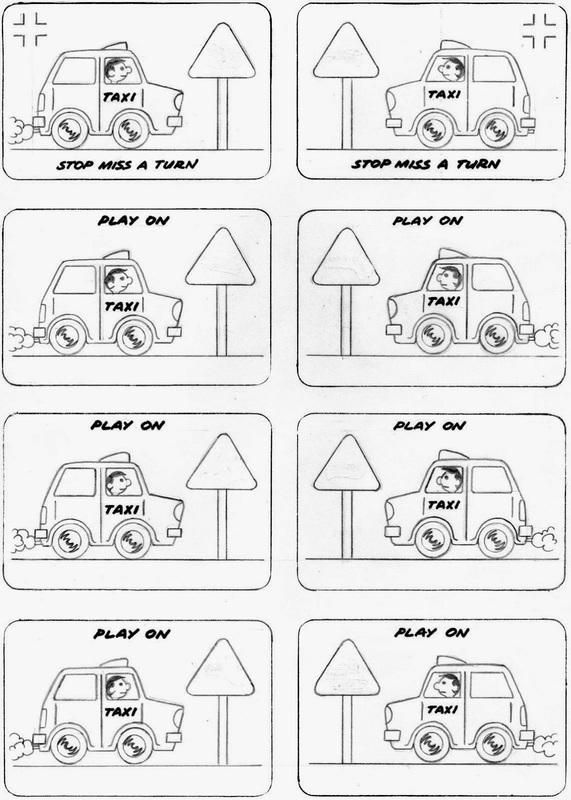 game he'd come up with designed to teach kids road safety. alive after all this time or, indeed, even what his name is. Where's SHERLOCK when you need him? 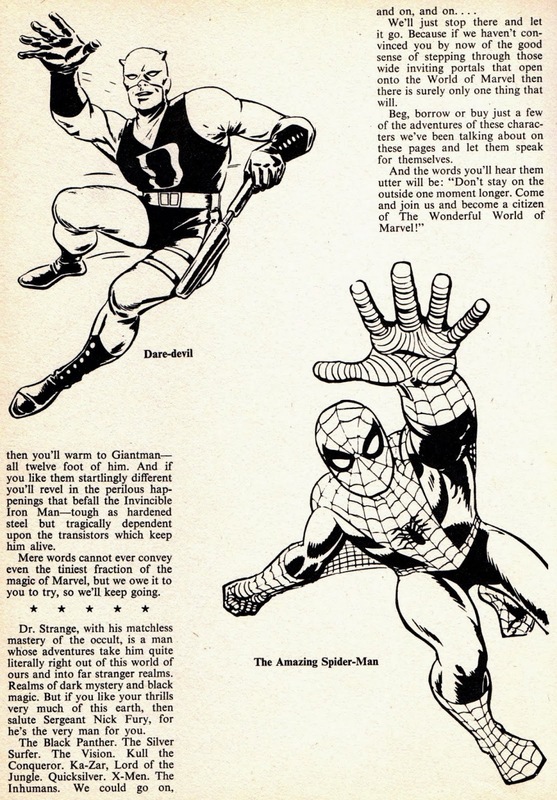 For those who may be interested, I finally managed to find the photocopy of my letter published in The MIGHTY WORLD Of MARVEL back in 1977 - so, as promised, here it is. I'd forgotten the number, but I also uncovered a copy of a later letters page reply which identified the particular issue - #226. Now all I need to do is discover in which number the reply was published and I'll be a very satisfied man. Unfortunately, the copy of my missive is far too faded to reproduce well, but I managed to discern what it said and retyped it so you can read what my younger self was saying in 1977.
that is losing its legends, a world that has lost its heroes." 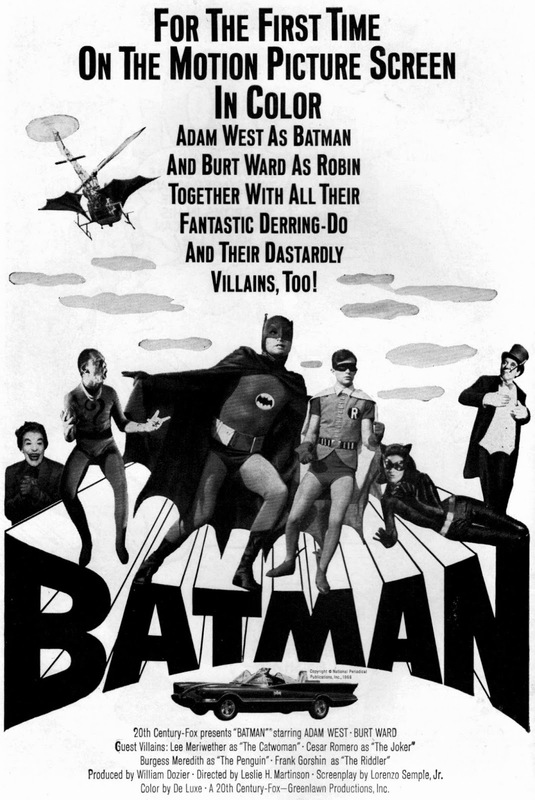 justice, you immediately think it's a film worth going to see. for your friend with a double-barrelled shotgun. it were normal, with faults and follies the same as we ourselves. a James Bond movie or "Crossroads"? not affect him in any way. 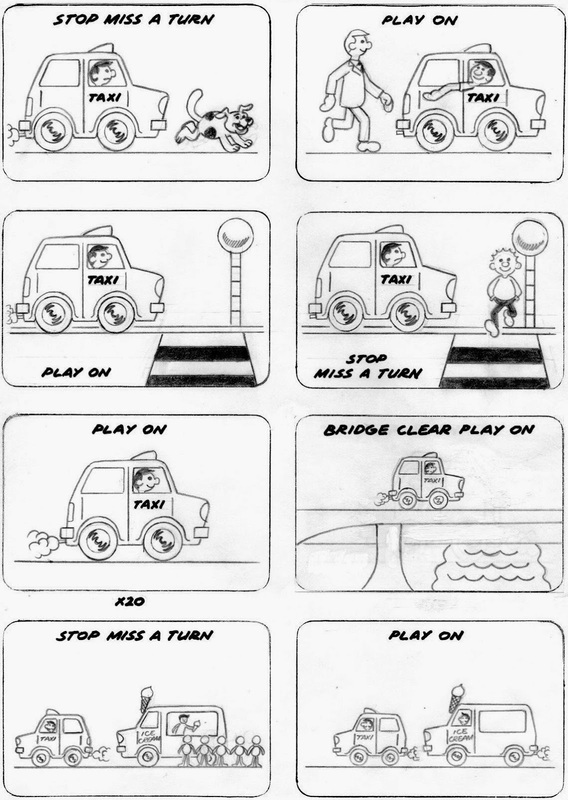 read "Funny" comics or read comics filled with signs of reality. Think it over again. You might feel differently. I'm sure I replied to Lance's letter, but no longer recall whether it was published or not. Going by his response to my James Bond comparison, it seems plain that he didn't quite get what I was saying. In fact, I'm far from convinced that he quite got what he was saying either, as his logic lacks cohesion, based, as it is, on a misunderstanding of my basic point. Looking at my letter all these years later, I can only wonder why I used an obsolete word like 'relievement' instead of 'relief', but apart from that (and using the word 'media' instead of 'medium'), it wasn't too bad, considering. So, how do I wrap this up? 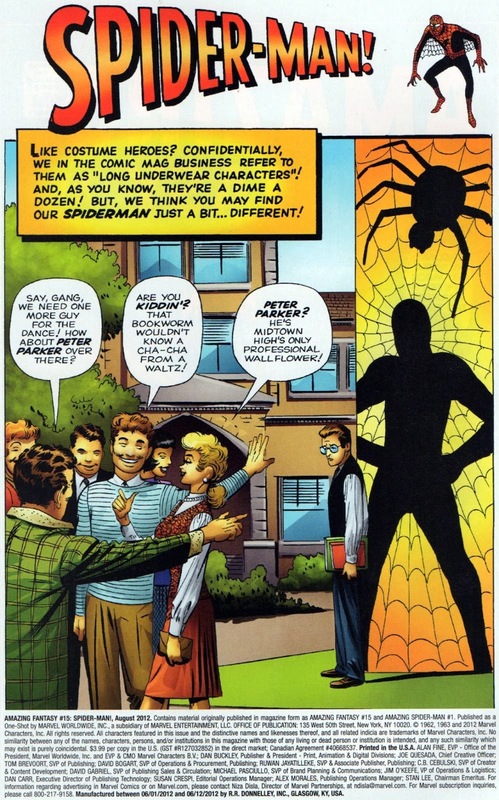 Ah, I know... "Make Mine Marvel!" 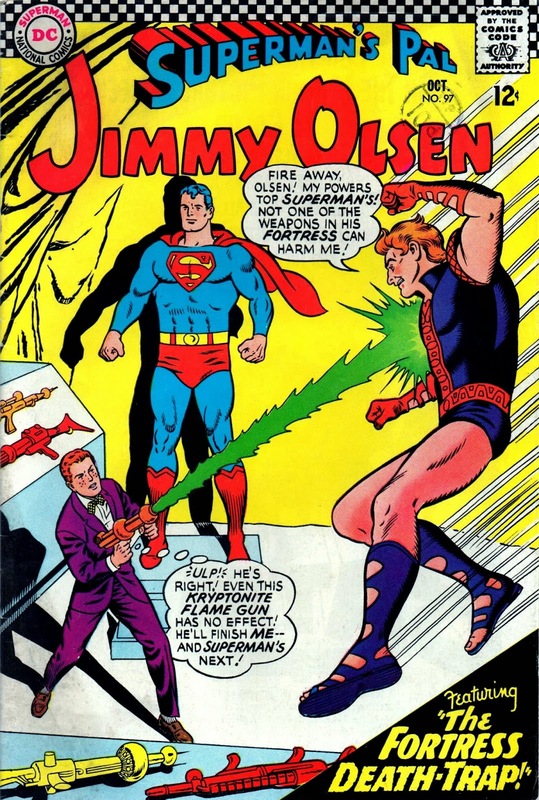 UPDATE: Since first posting this, I've now acquired a replacement copy of the actual issue. It's like holding a little piece of history in my hands, which helps roll back the years to 1977 as if it were only a couple or so years back. Incidentally, I now realise why the photocopy of my letter was so faded - the letter itself as printed in the comic wasn't too sharp to begin with. Still good to have the 'original' back in my possession though. 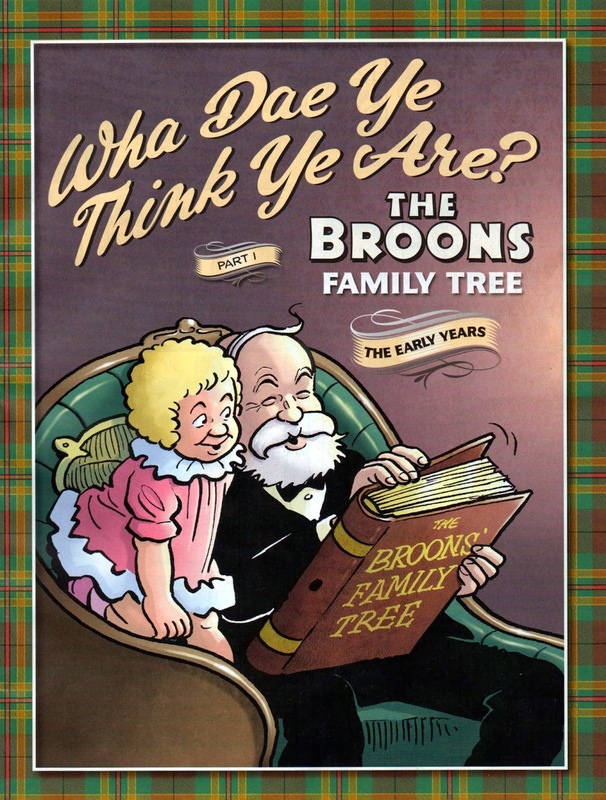 THE BROONS FAMILY TREE - with another to follow next week. FUN SECTION way back in the '30s. too large, lending a disjointed look to the finished result. 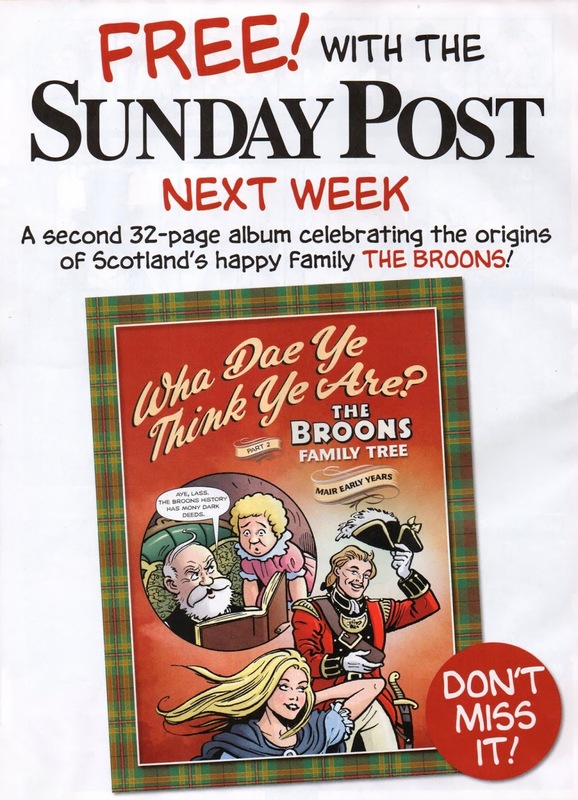 out and buy your copy of The Sunday Post today! 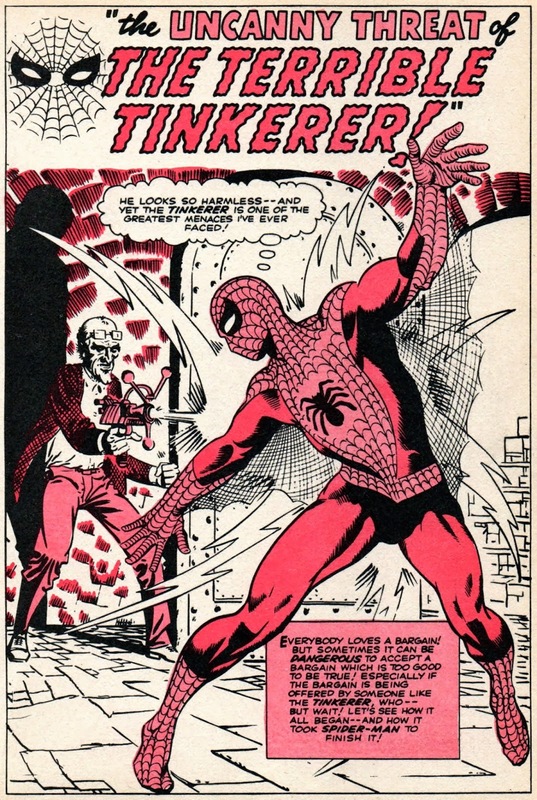 printing of Spidey's debut story from AMAZING FANTASY #15.
saw it in the Hachette edition. on the link in the first line to be whisked straight there! 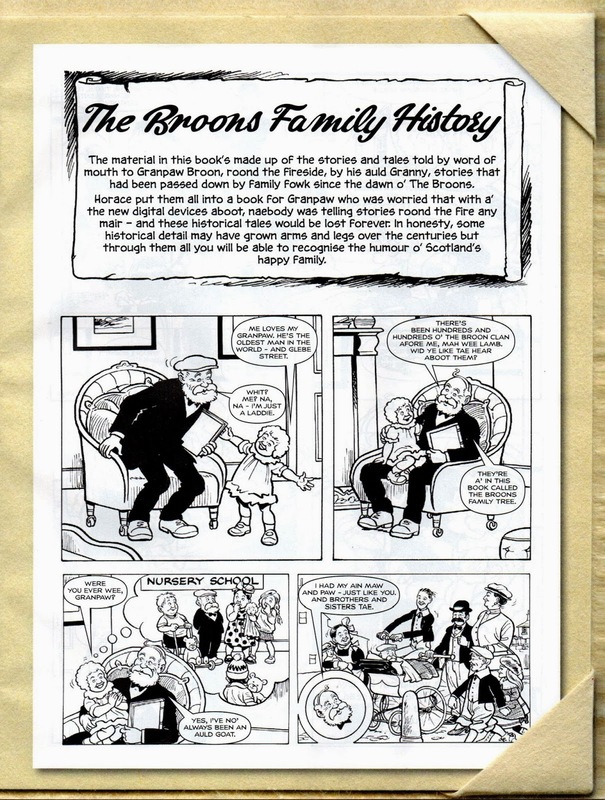 If you missed out on THE BROONS magazine in THE SUNDAY POST recently, my local newsagent was supplied with a stack of them - but no newspapers to go with them. I'm sure I could negotiate an acceptable price with him (including post & packing) for anyone desperate for a copy, so contact me via the comments section if you're interested. I use comment moderation, so your details will remain private. 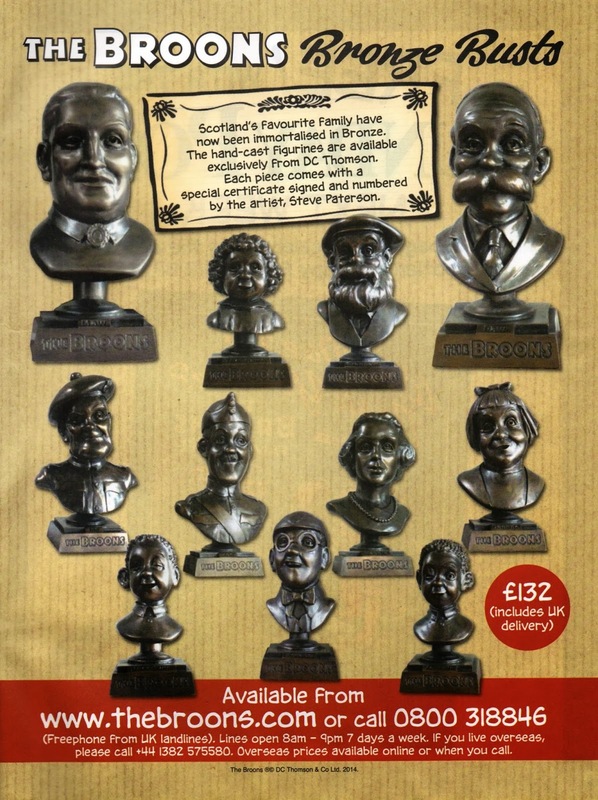 All dosh will go to the newsagent's, not me, so relax - I won't see a penny of it. 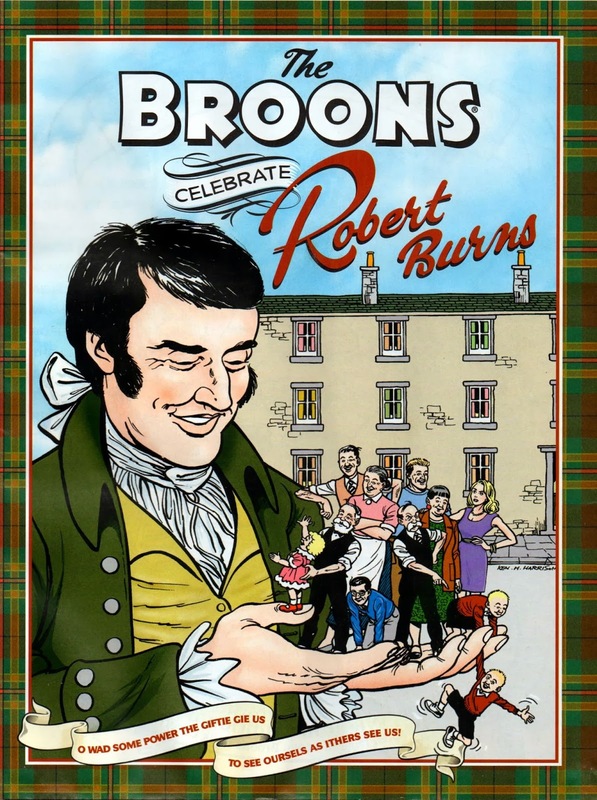 Containing poems by ROBERT BURNS, features, and comic strips (by DUDLEY D. WATKINS, KEN H. HARRISON and PETER DAVIDSON), it's a nice little collectors' item, so grab one now! Mere words from me are superfluous. 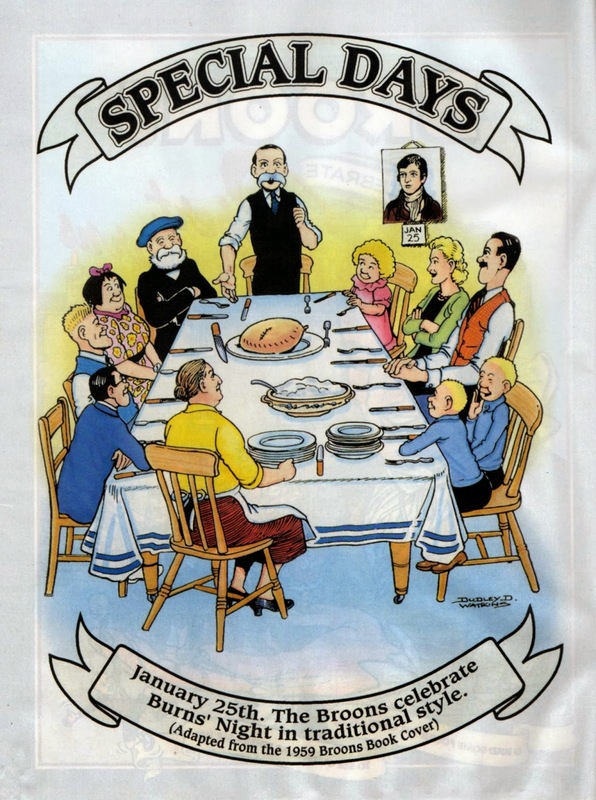 Just have the hankies ready. Mobile 'phones? Mobile ruddy 'phones? Don't get me started! Am I alone in considering them to be the most irritating, infuriating, antisocial invention of modern times? Help me salvage some rapidly-fading remnant of my hard-pressed sanity and tell me that I'm not the only person on the planet who thinks so. Don't get me wrong though. Mobiles are all very well - in their place! And that place is for making or receiving important calls which, if missed, could leave us knee-deep in the soft, smelly brown stuff. The trouble is, however, that very few calls or texts actually fall into that category. The telephone, once a practical and useful tool, has now been demoted to a mere toy - an idle distraction for the easily bored and the feeble-minded, who can never be content to simply be alone with their thoughts on account of not having any to begin with; who have absolutely nothing to say worth saying, but, thanks to the workings of a perverse fate, now have the technology with which to say or text it anyway. Example: "wot r u up 2 did u c big bruv last nite c u l8r"
Just think - all over the world, literally millions of people are exchanging such pointless, badly-spelt and punctuation-free drivel countless times a day. And simply because they can, not because they actually need to. "But if people are using their mobiles to keep in touch, then in what way are they being antisocial?" you might ask. Pay attention the next time you see a group of people anywhere. It's not uncommon to see friends or partners oblivious to one another as they gab or text away on their mobiles to someone else. Why not just go out with the person on their 'phone if they'd seemingly rather talk to them at the expense of whoever they're with? That's why they're antisocial. They drive a wedge between actual physical company and divert the attention of those who should be interacting with each other, as opposed to some ethereal voice or illiterate text on a mobile. If you were out with some friends who barely spoke a word to you because they were engrossed in deep conversation with one another, it's a safe bet that you wouldn't be too impressed by their manners. So in what way is it any less rude to ignore those you're with to talk or text on a mobile to someone else? That disembodied master or mistress whose imperious summons (heralded not by a heavenly fanfare, but rather a tacky and irritating ring-tone) must be answered immediately and cannot be ignored. Well, excuse me, but I've always thought that technology was supposed to be at our disposal and for our convenience, not the other way around. Hear that mobile ring - see its slave give a convincing impression of someone who's just had a tub of itching powder dumped down the back of their neck as, seemingly in the throes of spasm, they frantically check every pocket or aperture that fashion provides in order to obtain their regular fix of 'mobile madness'. 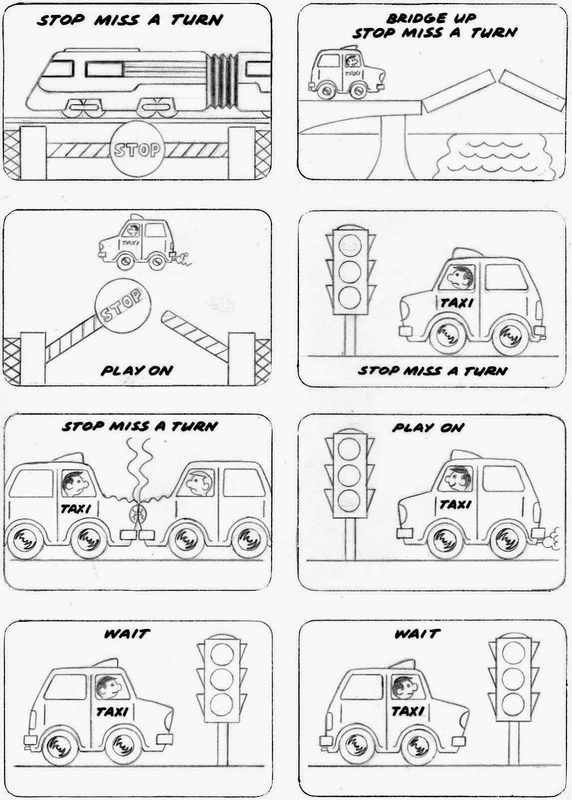 This madness, however, isn't confined only to adults. Children as young as 11 or 12 are falling victim to Repetitive Strain Injury (RSI), brought on by continually texting their friends. RSI? That's got to be one hell of a lot of texting! How sad. Where kids once merrily played together in fields and parks or each others' gardens, they now spend a disproportionate amount of time in their rooms texting (or emailing) their pals, instead of interacting together face-to-face. And, just like 'adults', when they are with their pals, they often ignore them while they text friends who are elsewhere. "A fool and his money are soon parted" runs the old saying. Considering the obscene profits reaped by mobile 'phone companies from the exchange of unnecessary communications between simpletons, it's plain to see that this maxim is true many millions of times over. So, let me ask you a question. 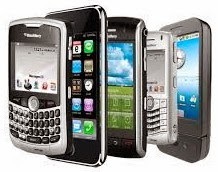 Do you possess a mobile 'phone? Or does a mobile 'phone possess you? It was 1975 or '76 - I was 16 or 17 years old and working in the warehouse of my local BOOTS The CHEMIST. 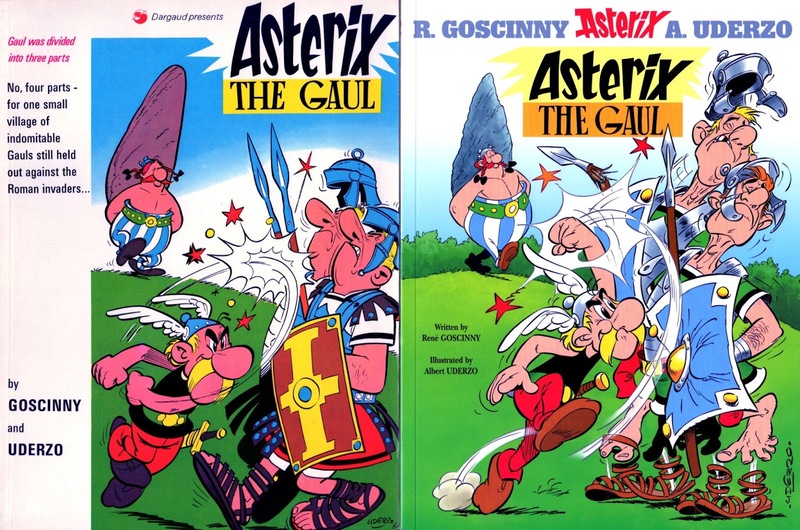 On my day off one Saturday, having been paid the day before, I treated myself to some ASTERIX The GAUL softcover books, which have been in my possession ever since. I've long meant to upgrade to hardback, but, somehow (aside from an Omnibus or three), have never quite gotten around to it. 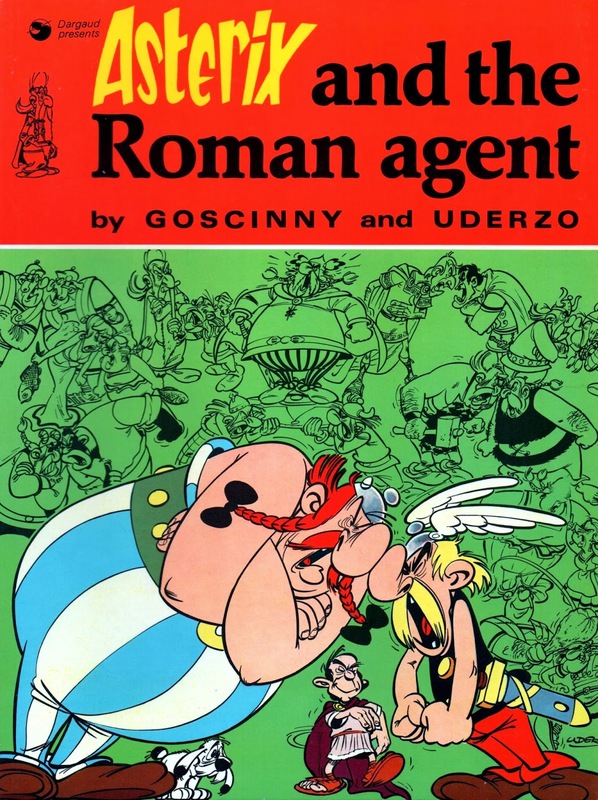 In the mid-'80s, when I was commuting to London every week during my freelancing days at IPC, I was given some file-copies of RANGER magazine (which I still have) by one of the editors, and was surprised to see that it had reprinted some of the Asterix strips in 1965 under a different title: BRITONS NEVER, NEVER, NEVER SHALL BE SLAVES. The setting was changed from Gaul to Britain and Asterix was renamed BERIC The BOLD, and OBELIX became DORIC, the son of BOADICEA. Their shield-riding leader, CHIEF VITALSTATISTIX, was called CHIEF TUNNABRIX, which I happen to think is actually a far better name. 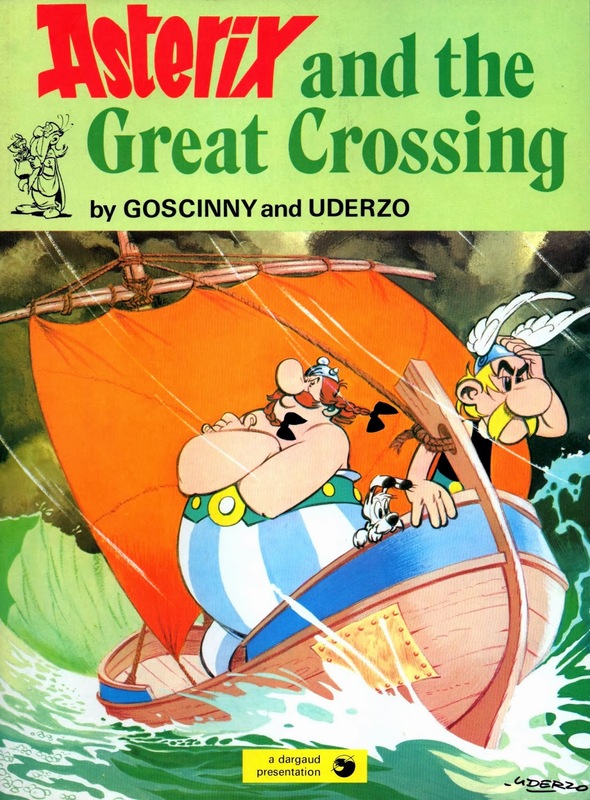 I was equally surprised to later learn that, just over a year earlier ('63), popular boys comic VALIANT had reprinted the first Asterix adventure under the title of LITTLE FRED - The ANCIENT BRIT With LOADS Of GRIT. 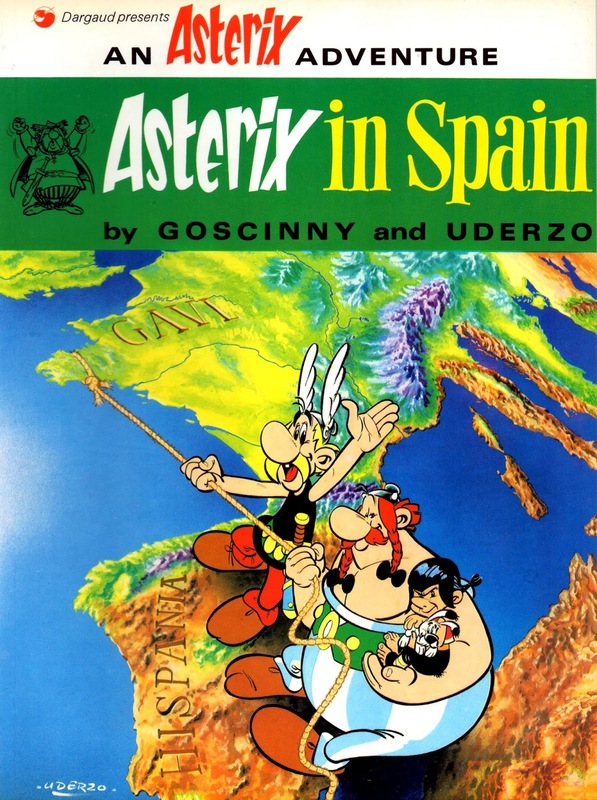 It would be 1969 before Asterix landed on these shores speaking English under his own name, and his full-colour books have enjoyed immense popularity ever since. If memory hasn't failed me, I bought nine albums on that afternoon back in 1976, got another one not too long after, and acquired six more over the next three years or so, completing the first 16 in the series. 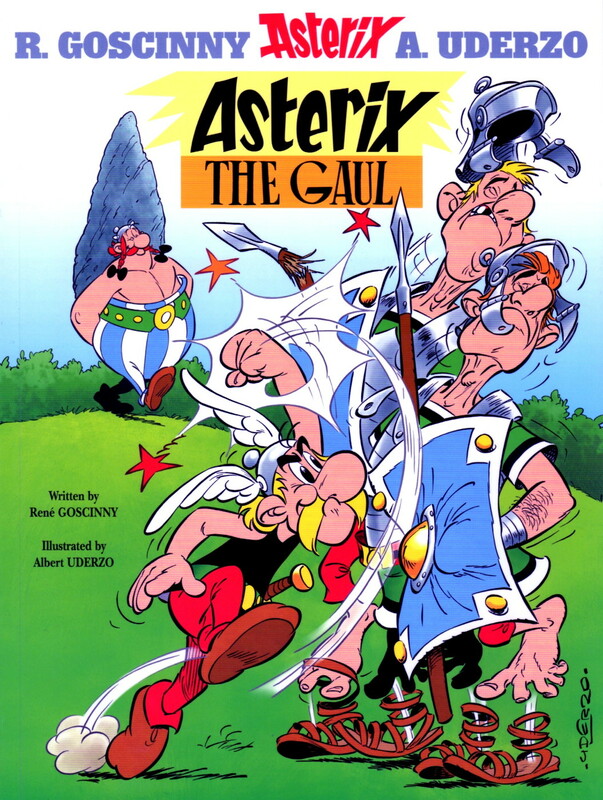 As you'll all doubtless already know, Asterix the Gaul was created by RENE GOSCINNY and ALBERT UDERZO and first appeared in the French magazine PILOTE in 1959. 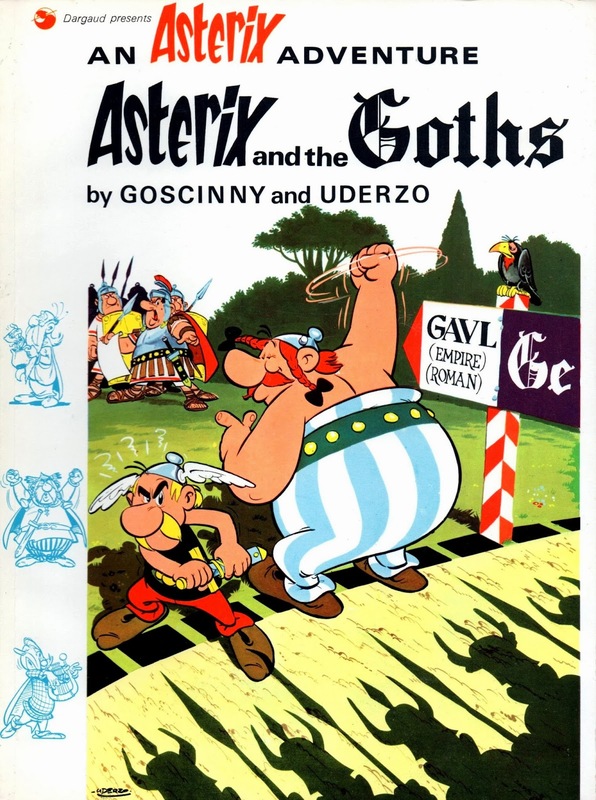 The art is simply superb and I can think of a few cartoonists working in British comics today who'd be well-served by following Uderzo's example of how it should be done. 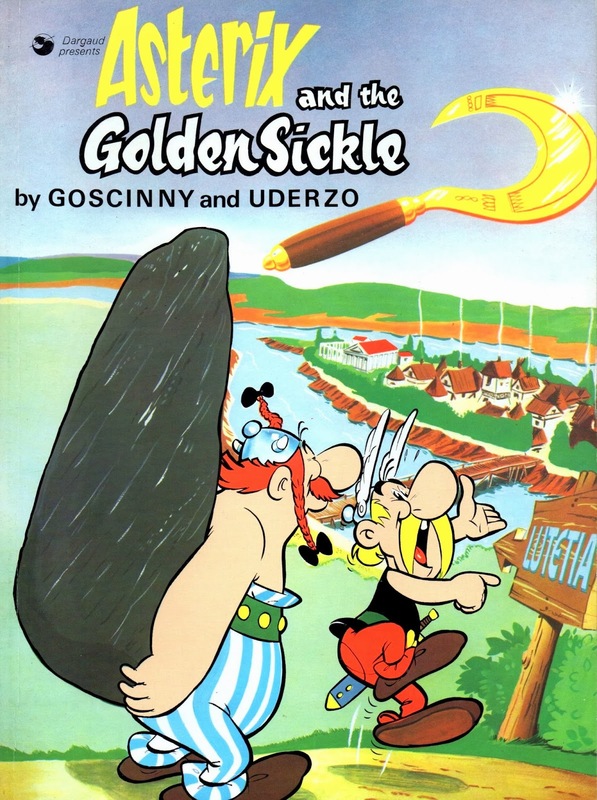 The English versions were translated by ANTHEA BELL and DEREK HOCKRIDGE, and later, I think, by Anthea herself, though I've no idea who currently performs the task. 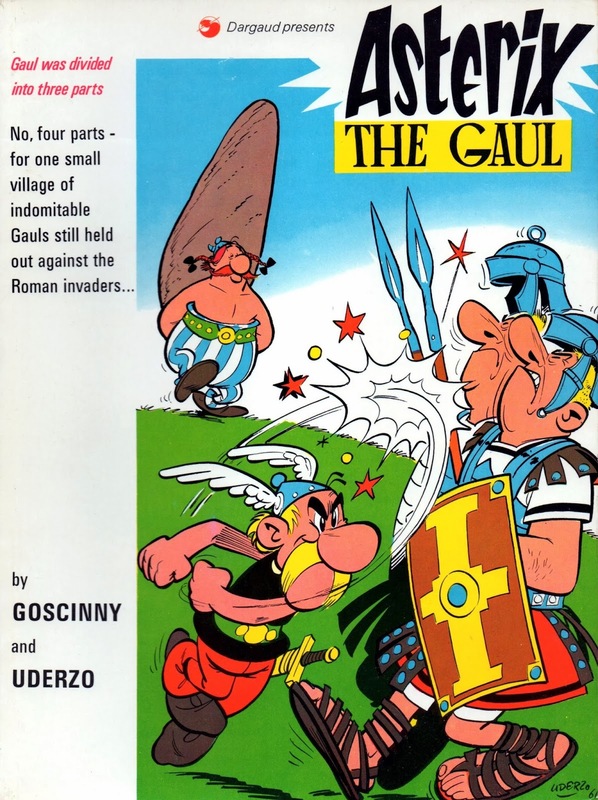 Here then, in honour of the plucky little Gaul, is a cover gallery of those 16 books in my collection. I've probably got a few other tales in my Omnibus volumes, but one day I really must get around to getting the full set. 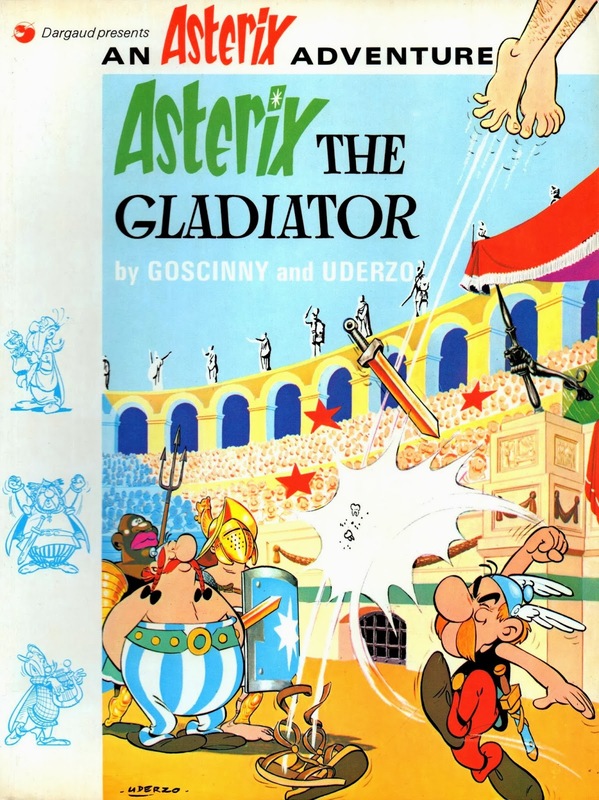 If you don't have any Asterix books of your own, run out and buy some today! Update: In 2004, the books were revised, being relettered and recoloured (or perhaps just using plates with the original French colouring), and the results are (mostly) a vast improvement when compared to the previous English-language editions. 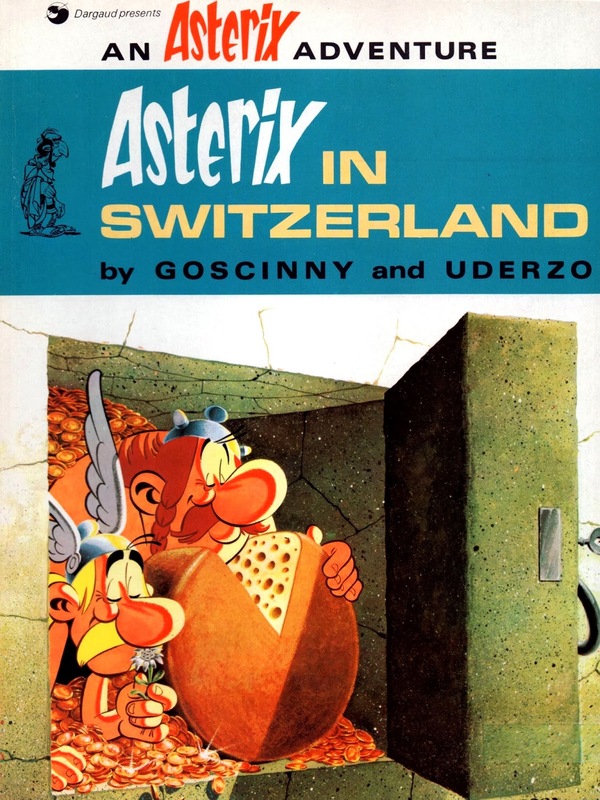 Uderzo also redrew the two introductory pages, and at some stage he produced a new cover, though I'm uncertain whether this was for the revised edition of 2004 or was done later. The new cover is shown below, first by itself and then alongside the original to better facilitate direct comparison. 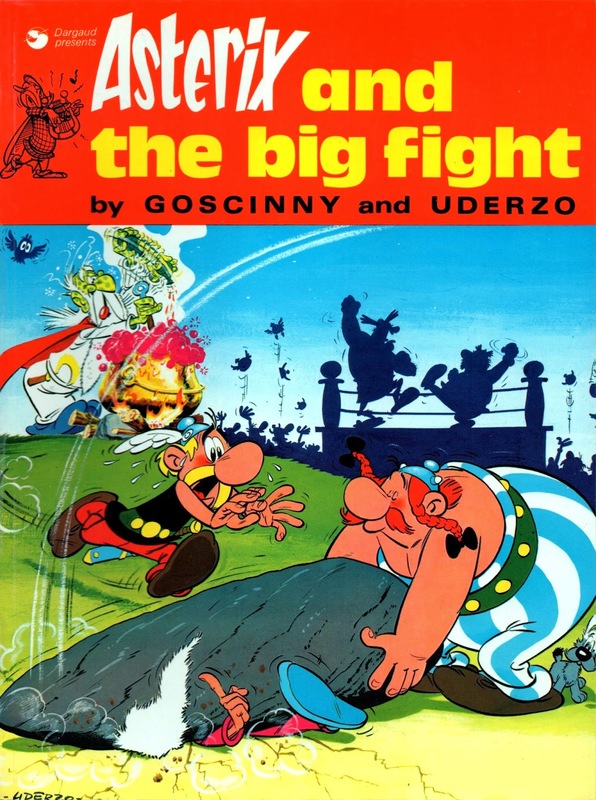 Incidentally, the new UK edition featured the redrawn rendition of page 35, produced by MARCEL UDERZO (Albert's brother) in 1970 when the original plate was lost, whereas previous UK volumes had used a blurry image of the original page sourced from an earlier French printing featuring Albert's version. IS HE PULLING MY STRING, ER...? 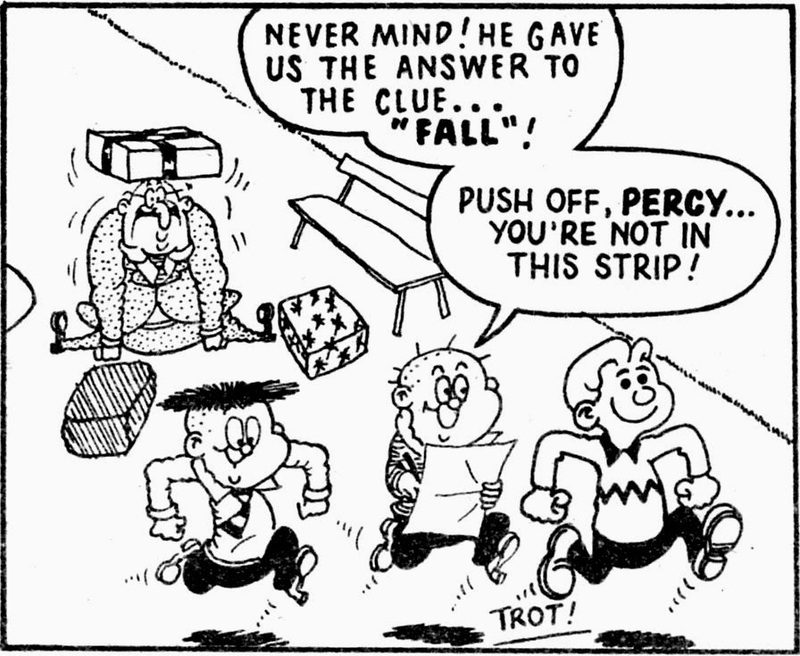 A TALE TO MAKE YOU BLUE - "GET DOWN, SHEP!"